By Joshua Gillin, Angie Drobnic Holan, Katie Sanders on Tuesday, March 3rd, 2015 at 10:16 a.m.
Florida Gov. 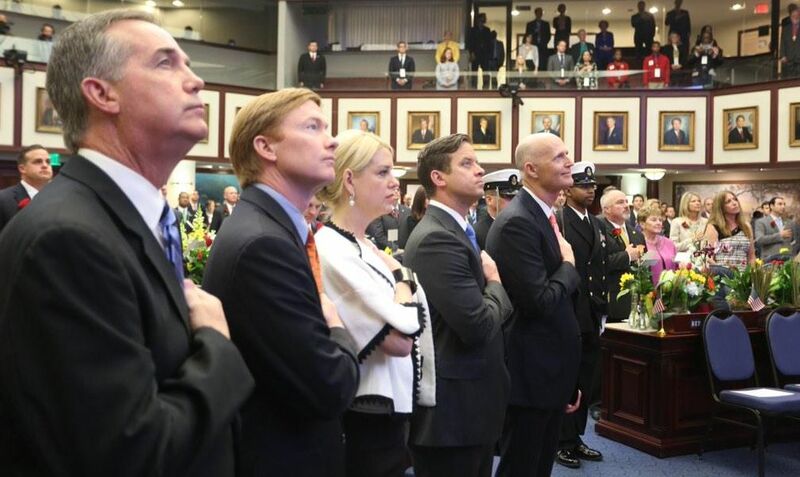 Rick Scott's 2015 State of the State, as prepared. So now it’s time for another state of the state speech, or as I like to call it – a chance for me to show off my world renowned oratorical skills. It’s ok, you can laugh, it was meant to be a joke. In the last four years, the unemployment rate in Florida has dropped in half – from 11.1 percent to 5.6 percent – the second biggest drop in unemployment in the United States. We have added over 728,000 new private-sector jobs. We have 279K job openings right now in our state. In the last year, around 250k people moved to our state and we are now the third biggest state in the nation- bigger than New York. From 1992-2011, Florida inherited $100 billion in adjusted gross income from other states. This is more than 1/8 of our annual GDP. Last year, we had our fourth record year of tourism- 97.3 million people visited our state. Clearly our investment in Visit Florida is working, and every 85 tourists create another Florida job. We are home to over 250 languages. We are at a 43-year-low in our crime rate. We are clearly the best melting pot in the world. Housing prices are up. Taxes are down. We have cut taxes more than 40 times in four years. We have no personal income tax. The average person pays about $1,800 in state taxes in Florida – the lowest in the nation. Lowest number of state workers per capita in the country – and we are going to continue to look for productivity gains. Our LLC’s and Subchapter S corporations don't pay a business tax. Over 80% of our C corporations don’t pay the business tax. We have reduced taxes for our small businesses. Florida is an exceptional place. As far back as the 1800’s, people were moving to Florida to make their dreams come true. In 1851, a doctor and researcher in North Florida received a patent for a refrigeration invention he developed after experimenting with ways to cool a room to make his patients more comfortable. Today, we know this man as the "father of air conditioning" and without John Gorrie’s invention, the beauty of Florida wouldn’t be home to almost 20 million people today! In fact, some of the people whose dreams are changing the world are here with us today. Please help me welcome: Richard Gonzmart, the fourth-generation President of the Columbia Restaurant Group in Tampa – Florida’s oldest restaurant. Mary Ann Carroll – a world renowned artist from Florida – unfortunately could not be with us this morning. Mary Ann began selling her paintings in the 1950’s along Fort Pierce’s roadsides. As an African American, she said she was not allowed into any galleries at the time. But, with her 60-year career of hard work and many struggles, Mary Ann now promotes the beauty of our state through her artwork hanging in museums and galleries all across the world. Please help me welcome theme park designer Bill Coan - president of ITEC Entertainment Corporation in Orlando. Bill has designed theme parks and attractions around the world, like Daytona USA. Students can spend their money better than government can. It should not require a federal loan and decades of debt for students to get a college degree. Price limits access – plain and simple. Let us never again say that, "we have to raise tuition because tuition in other states is higher than ours." We don’t raise taxes when other states have taxes higher than ours, and we shouldn’t raise tuition when other states have higher tuition. Third, to out-compete the world, we must invest in workforce development. Our recommended investments this year include: $30 million for high-skill workforce training;$20 million for advanced workforce training at our tech centers; $5 million to incentivize$10,000 STEM degrees at our state colleges; and $1 million to create a paid summer program for STEM teachers. Fourth, if we are going to out-compete the world, we must invest in K-12 education. This year, we are recommending an increase in K-12 funding to $50 above the historic level to $7,176 per student. Four years ago, I stood before you and said we would have to make some hard decisions. And, we did. We made reductions that dipped into education, knowing that when the economy improved we could invest again. Many of these decisions were unpopular, but by living within our means it created an environment for success. Few thought we could add 728,000 jobs, have the highest funding for education, and invest in our environment just four years later. But, we did it together – and we have more work to do. The final thing we must do to out-compete the world is keep Florida beautiful. Florida is an exceptional place – we have the economy and the opportunity to keep it that way. Our recommended budget includes more than $3 billion for environmental and agriculture programs which includes a total of $150 million in funding to protect the Everglades and another $150 million that will help protect land for the Florida panther. It is important to point out that our recommended environmental investments in land and water programs will be $82 million above what is required by Amendment One. In the weeks ahead, I expect some people will try to divide us. They will try to distract us. But, Mr. President, Mr. Speaker - I believe we can come together with our shared desire to improve this great state. Many of our shared goals are already outlined in your "Work Plan 2015." Members of the Senate, Members of the House - I commit to all of you that I will be a tireless partner in your fight to make Florida the best place in the world for all of our children and grandchildren to get a great job and live their dreams.